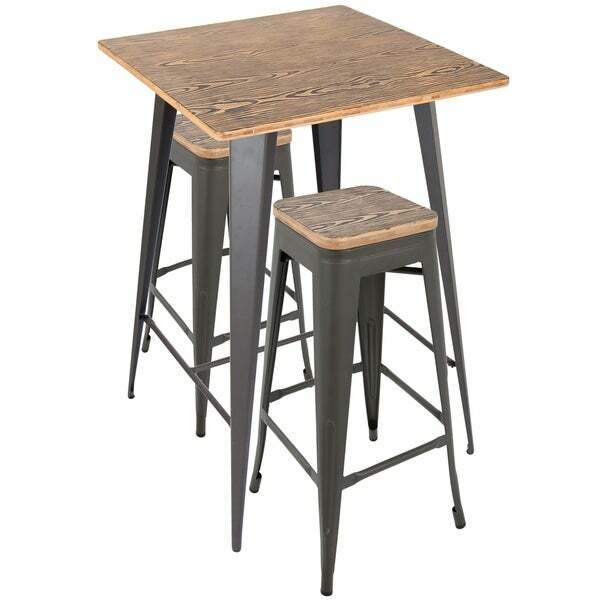 Versatile and stylish with an industrial feel, the LumiSource Oregon Pub Set is the perfect piece to achieve the rustic warehouse vibe in your home. Constructed from steel and wood the Oregon Bar Set was built to last. Available in various finishes, pick the set that suits you best! This table is the perfect size for a single person in a 1 bedroom apartment. It looks great and has a "lofty" sort of style to it. The table assembles very quick and easy while the stools come fully assembled. I would like to have given this 5 out of 5 stars, but because the table top isn't smooth I can't write on the table. It has a grainy rustic texture to it. Overall great table for a great price! Love this rustic table. I have had this table for a little over a year and has held up great! I don't have a large kitchen, so this fits perfect in the corner. The table is small but big enough for two people and an extra dish on the table or person to squeeze in. The table was very easy to assemble and easy up keep. Definitely recommend! Absolutely love this pub set! Purchased one for small condo for college student and it was the perfect size and style. Great quality- sturdy and already assembled! We bought this piece almost 3 years ago now and still love it. It's very sturdy, and perfect size for our small apartment. The seats are what you'd expect, not the most comfortable, but again, what you would expect. Also, it was super easy to assemble when it first came. 5 stars. Cool table for a single guy. This table set is made with heavier metal than you would expect and everything feels very stout. Goes together in about 15 mins which I couldn't be happier about. Great product! This table made the perfect addition to my house! We love it! I would recommend this product! Was perfect everyone wanted a set like it ! This table and chairs look great. They seem to be made of a high quality and they were super simple to put together. My only gripe is that they aren't as comfortable as I would have liked, but they're made of metal and wood so what do you expect? Very sturdy and well crafted! Easy to assemble. Love the texture of the Tabletop. Great Product! Im so happy for this purchased and I highly recommend this to everyone!!! Great for our other door area. Easy to put together, surprisingly sturdy, Looks nice and rustic. I bought three for a lounge i created at a conference and the attendees used them and sat in them for a long time. Some people commented that they wanted to buy them for their house. "Which color is pictured? There are two color options listed but only pictures of one. i want to make sure i order the correct one." The dark brown tabletop finish shown in the first few images is the antique option. The lighter brown tabletop finish is the grey option. "which is the 3-pc Grey? What is the table top?" 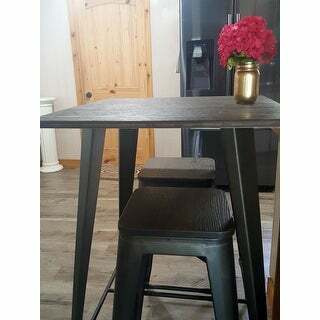 The metal is matte gray and the top is a medium brown wood finish. Small and industrial set for a city loft with small dining area. Edgy; not a space-hog. "Is the darker top option the "antique?"" Hello ShopGirl, yes, the darker antique finish has the dark espresso wood top. The matte grey finish has the lighter bamboo wood top. Thank you for shopping with us! "Can you purchase more stools for this table?" Hello schwinn140, we are sorry, we don't know if just the stools will ever be purchased. 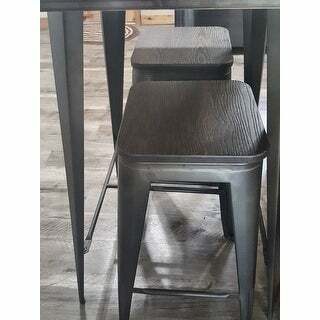 But, please check out the Signature Design by Ashley Glosco 30-inch Wood and Metal Bar Stool (Set of 2), item 16999952 or the Davie 30-inch Bar Stool, item 16951019. Have a great day.